Backyard Summertime Night Sky over New Jersey. Jet Transiting the Waxing Gibbous Moon. I am still having issues with the video mode automatic gain “feature” with the Nikon D3s. In doors with normal light levels it doesn’t seem to be that much of a problem. 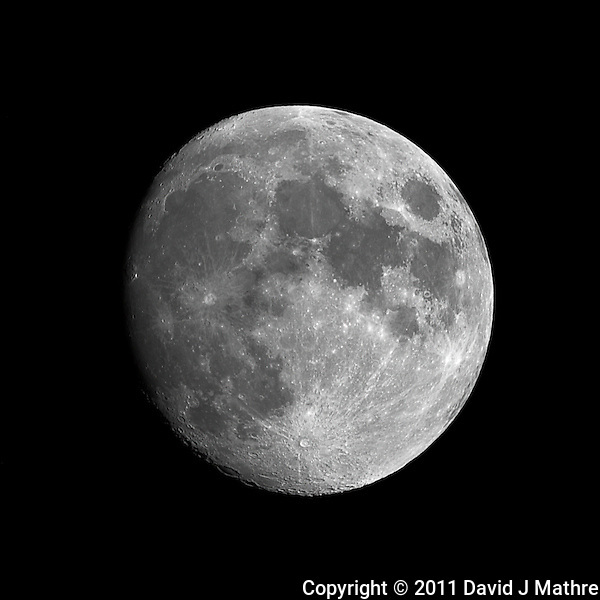 However, when trying to take video images of the moon through a telephoto lens, the moon is over-exposed. During the testing, I managed to catch a jet transiting in front of the moon. I happened very quickly (less than one second). The video below shows the transit across the lower part of the moon 1) as is; 2) zoomed in from 100% to 250%; and 3) zoomed in at 250% and slowed down to 33% speed. There was also some cloud cover moving during the sequence. I also took some still images of the moon with the same camera and lens, but with a TC-E III 20 teleconverter. The goal was to see how sharp an image of the moon I could get with a 1200 mm lens. Focusing was through “Live View”, and to minimize camera shake used the “mirror up” mode to allow the system to stabilize. The D3s allows the use of “Live View” and “mirror up” because “Live View” is now selected via a button on the back of the camera. You don’t have the ability to use “Live View” and “mirror up”. The first still image of the waxing gibbous moon at 92% illumination was taken at ISO 200, f/8, and 1/200 second. The second at ISO 200, f/16, and 1/50 second. If I did my calculations right for a 1200 mm lens on a FX sized sensor, the moon should only move ~0.2 pixels for a 1/50 second exposure.